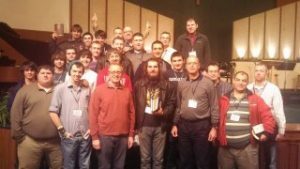 Men of God Conference: This is an all day conference that 20-30 men from our church attend every year in Bellefontaine, Ohio. 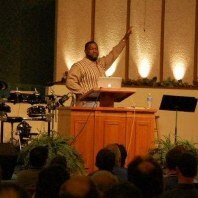 The conference features a main speaker who shares from Gods Word on a given topic in 3 or 4 different main sessions. There is a special music group that is invited to both perform and lead worship for the day, and there are also many different “breakout sessions” to choose from. Lunch is provided and we also stop somewhere on the way home and have dinner together. Its always a great day! Mens Events: Special events include things like an occasional Golf outing, a mens breakfast, a Father-Son campout, or whatever gives us an opportunity to encourage one another to make following Christ our first priority as men. Church Work Days: Several times a year our men take a Saturday and work on miscellaneous projects around our church building. Painting, Landscaping, odd jobs, etc. give our men an opportunity to serve the church family in a practical way and also to connect with one another by working together. We finish the day with a pizza, a coke, and some time of fellowship! HUMLITY: Be teachable, transparent, and accountable to one another. STUDY: Complete your workbook, read, study, do the work! DEVOS: Be faithful in DAILY Bible Reading & Prayer. CHURCH: Attend Worship & Connect Groups every week. SERVE: Serve at church every week. MULTIPLY: Be willing to disciple others and help them follow Jesus.